I've realised that I blog a lot about my assistance dog, Elgin, but I don't feature our other pets often enough. So I thought I'd start a series of blog posts that introduce you to my pets and those of my co-bloggers. We start the series with Cherry. Cherry. This photo was taken a few days before she had her second eye surgery. Absolutely any food! Playing with other dogs. Cuddles. Photo credit- St Giles Animal Rescue. Cherry arriving at the rescue centre. Cherry spent the first three years of her life living in squalid conditions in a puppy farm where she had at least one litter of puppies. 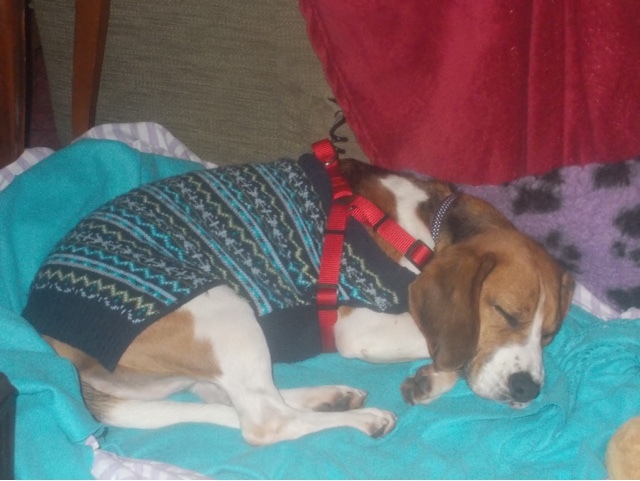 When she developed medical problems the owners decided she was no longer of any use to them and planned to send her and several other beagles to an animal testing laboratory in France. 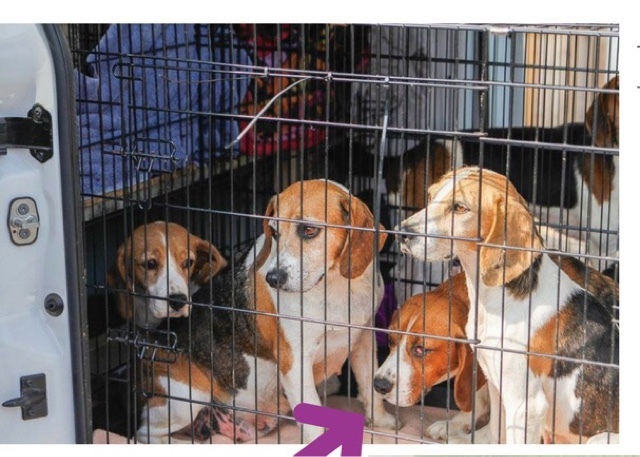 Thankfully, Cherry, the other beagles and some basset hounds were saved by a rescue charity and were brought to Somerset. 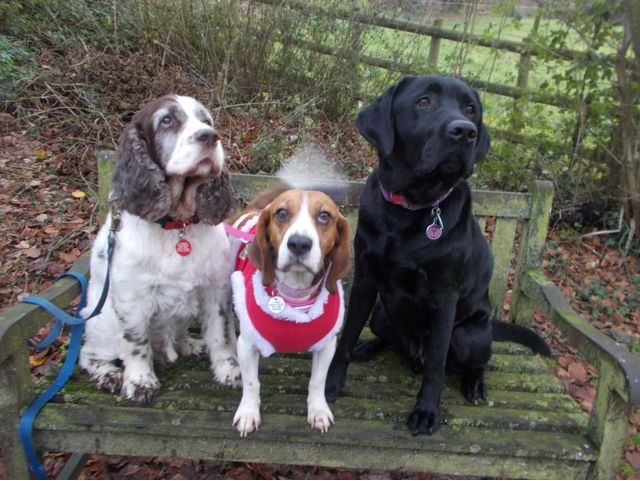 These dogs were all extremely nervous, and Cherry was one of the most nervous of them all. These dogs had spent their whole life in a dark, dirty pen. They'd never been on grass, never walked on a lead and never known love and affection from humans. They didn't even have names - Cherry was named this by the rescue centre because she had a cherry eye. The world must have been a scary place to them. Cherry on her first night in our home. They arrived at the rescue centre in June 2016. 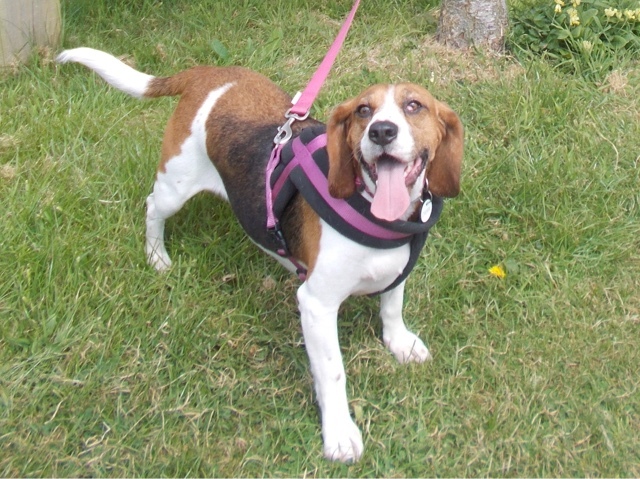 By November 2016 most of the beagles had found homes, but Cherry was still in kennels waiting for someone to choose her. In those few months she had eye surgery (and she has since needed two further surgeries) and the rescue's staff and trainers helped her learn how to be a normal dog. At the end of October 2016 our mastiff cross Great Dane, Jessie, suddenly passed away aged just 7. Jessie was Elgin's best friend and he missed her terribly. He got extremely depressed and we knew that he needed a new friend to keep him happy. I asked our local rescue centre if they had any dogs that we could immediately foster (I used to be a trustee for them and were already home checked etc). The only suitable dog was Cherry, so we went to meet her. She instantly got on well with Elgin and was respectful of our frail, elderly spaniel Henry (who has since sadly passed away) so we brought her home with us. Henry, Cherry and Elgin one month after Cherry came to live with us. 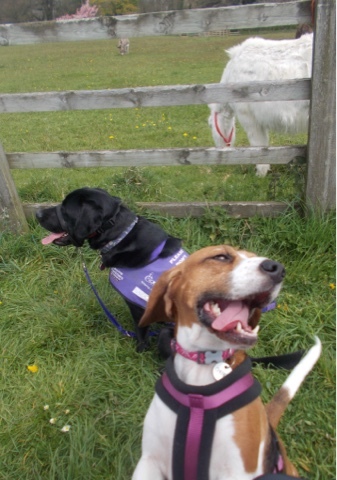 When Cherry arrived in our house she was scared of everything, she was completely overwhelmed. Luckily she quickly bonded with both Henry and Elgin and really followed their lead. She learnt that people were nice and that hands weren't to be feared anymore - they now meant tickles, cuddles and her favourite thing of all, treats! Elgin taught her how to play and she soon beam a fun, happy dog. 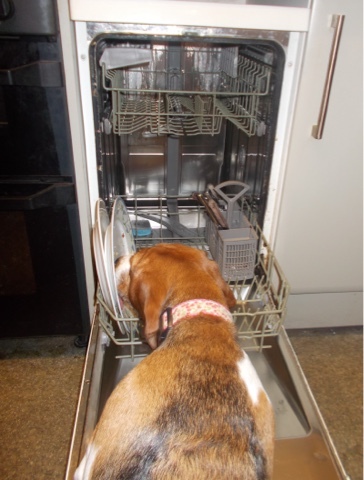 One of her bad habits! It's not all been plain sailing. Cherry was extremely nervous when she arrived and got spooked on a walk. She pulled the lead from my mum's hand and went missing for nearly twenty four hours. This was a traumatic, terrifying experience for Cherry - and us. Thankfully she was found hiding under a hedge by a gardener and came home wagging her tail like nothing had happened! After this we couldn't bear to let her go to another home, and went from fostering her to officially adopting her. Cherry is a big character in a little body, she makes me laugh so much. She's a sweet dog and is now extremely affectionate - so different to how she was a few months ago. She does have some naughty habits and house training her has been difficult, but she's worth the hard work! Cherry still is nervous is some situations, but she's gaining in confidence every day. She's a special, cheeky little girl and we love her so much. This post contains huge valuable information on our pets. This article can help by preventing risk. Truly it’s a nice job. Nice and informative information.Thanks for sharing with us. I would like to suggest Dental Fresh Advanced Plaque & Tartar for dog.